The cynical manipulation of Canada’s quasi-corporate new ‘commemorative project’ shows a disregard for both the environment and genuine collective memory. The project – described as a public-private partnership – is causing serious concern among some Canadians for the threat it poses to the surrounding environment, for the perceived lack of transparency in the way it is being hustled by Parks Canada towards approval, and for the impression some have that this is as much an exercise in marketable nationalism as it is an attempt to recognize the ultimate sacrifice. Mother Canada is the creation of Toronto businessman Tony Trigiani – filling in where our folklore has apparently failed. The figure is to be at the center of the larger Never Forgotten Memorial, which is intended to commemorate those Canadian soldiers who died and lie buried outside of Canada or who were lost at sea. The private Never Forgotten Memorial Foundation is leading the project, with Trigiani as President of its Board of Directors. The design of the monument depicts a cloaked female figure, which will reportedly stand 10 storeys tall on a small, granite outcropping in Green Cove, Nova Scotia – part of the environmentally protected Cape Breton Highlands National Park. With her arms outstretched towards the Atlantic Ocean, Mother Canada will be the embodiment we’ve never had of the cultural values we presumably share – she will be our Marianne, our Uncle Sam – and, like any good icon, Mother Canada has been trademarked. Like her allegorical cousins, Mother Canada’s raison d’être is interwoven with war. Yet unlike Uncle Sam or Marianne, Mother Canada is being introduced in a time of relative peace. It is the latest in a series of war-related monuments being constructed with strong support from Prime Minister Stephen Harper and his Conservative government. The strangest of these is certainly the Harper government’s plan to erect a monument to the world’s victims of Communism. Planned for construction on a parcel of land between the Supreme Court and the National Library, the location of the memorial had already been earmarked as the planned location of a new Supreme Court building. The government’s decision to reallocate the site has been attacked as political bullying, and the site criticized as inappropriate – its prominence suggesting that Canada has its own direct history of communism. In its meditation on death and dictatorships, there are those who feel it will set Canada’s highest court – a place that should stand as a beacon of truth and justice for Canadians – in a landscape of foreboding and menace. Canadian Chief Justice Beverly McLachlin, in a letter sent to Public Works that was obtained by the Ottawa Citizen, voiced her concern that the memorial “could send the wrong message within the judicial precinct, unintentionally conveying a sense of bleakness and brutalism that is inconsistent with a space dedicated to the administration of justice.”Harper’s desire to pay tribute to the world’s victims of Communism is particularly ironic, given that his taste for monuments has a distinctly Soviet feel. Many, including veterans of the Second World War, have questioned what the Mother Canada project is really about. The fact that the names of the war dead will not be recorded on the site of their own memorial is a particularly odd choice that, as Heather Laskey pointed out in the Halifax, Nova Scotia newspaper the Chronicle Herald, puts it in marked contrast to the memorials to Canada’s war dead that exist in cities and towns all over the country. 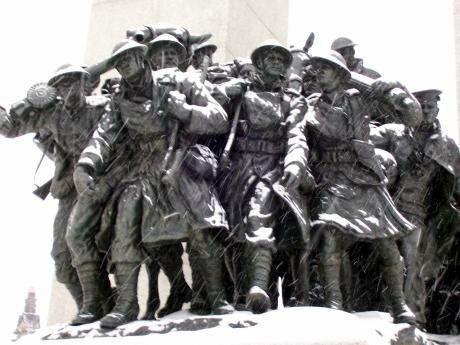 Ottawa's current First World War memorial. Photo: Zhu via Flickr. Some rights reserved. While the names of those commemorated by the monument will be digitized and available for viewing online, there will be opportunities for private and corporate donors to have their names commemorated on the memorial site itself. In addition to the figure of Mother Canada, fleshing out the Never Forgotten memorial site will be a host of features with names derived from the Canadian national anthem that are so maudlin, they almost read as a parody. These include the “Commemorative Ring of True Patriot Love,” the “Glorious and Free stone pillars,” and of course, the “We See Thee Rise Observation Deck.” A restaurant, souvenir shop, interpretive center, and parking lot to accommodate 300 vehicles complete the tribute. A CBC news online story about the site quoted one Second World War veteran, 93-year old Valerie Bird, as saying "it's vulgar and ostentatious. It doesn't do anything for veterans or definitely not for the people who are dead." Admittedly, Mother Canada’s creation myth could use some fine-tuning: ‘born fully formed from the head of Tony Trigiani’ doesn’t have quite the same dramatic thrust that has benefitted other such origin tales. The memorial site Mother Canada will oversee commemorates people who had never heard of her. Unlike this dubious allegorical figure, the people she commemorates lived and died in a very real historical context, and their memory needs no sponsorship. If she needs a better back-story, Mother Canada at least has a ready-formed cult, and they are powerful, too. The Never Forgotten National Memorial Foundation’s list of Honorary Patrons includes Canada’s Minister of Justice and Attorney General Peter MacKay, former Prime Minister John Turner, Mila Mulroney (wife of former Primer Minister Brian Mulroney), as well as a selection of top journalists and anchors from the country’s national broadcasters, including the Chief Correspondant of CBC News, Peter Mansbridge, prominent CBC television and radio host Rex Murphy, and Lloyd Robertson and Lisa Laflamme who are top anchors from the CTV network. Considering the controversy surrounding the project, it is surprising that the involvement of such prominent journalists is not viewed as a conflict of interest. The memorial site also poses environmental concerns. The Nova Scotia chapter of the Canadian Parks and Wilderness Society (CPAW-NS) has expressed serious concerns over the potential impact of the project, pointing out that the National Parks Act states that Parks Canada must first maintain the ecological integrity of its sites. They have expressed doubts how a project involving a period of substantial construction, the introduction of businesses, and heightened vehicle traffic would not damage what they describe as “a sensitive coastal headland”. This appearance may be well founded. According to Laskey, Justice Minister Peter MacKay has stated that the government will let “the private sector investors decide what shape the monument ultimately takes.” Mother Canada, it seems, knows on which side her bread is buttered. While the private sector is credited as the primary source of the project’s funding, many believe that any shortfall in meeting the cost of construction (which estimates put at anywhere between $25 – 60 million) and ongoing maintenance would be paid for by taxpayers. It remains to be seen how the government would reconcile this expenditure with their recent closure of a number of Veterans’ Affairs offices around the country, and controversial changes to compensation packages for wounded soldiers. Indeed, while fighting a lawsuit brought against the government by wounded veterans of the war in Afghanistan who were concerned that those changes would significantly reduce their compensation, the government argued that it has “no social contract” with Canada’s veterans. If the controversial project goes through, Mother Canada might want to begin saving for her own long-term care.